Well, this officially is one of the shortest giveaway’s I have ever run. With some changes today to the registration deadlines for the 13.1 Marathon Chicago I was afraid if we waited till the original closing date that the winner would not have a chance to register for the race before online registration closed. I am excited to get the amount of entries I did given the timing of this giveaway for a free race entry to the 13.1 Chicago with the race just one week away. I am even more excited with how many people “Liked” this giveaway and Tweeted it from the buttons on the page. This is a true indication about how much you liked this giveaway, even if you were not able to run this race. Hopefully we can turn that enthusiasm into more race entries for upcoming races…. we will have to see. Don’t forget, if you are not the winner you still have time to register online at the current $80 price until midnight Sunday, and then just a few more days to register online before registration will only take place on race morning. For such an awesome looking course along the banks of Lake Michigan I am not sure why anybody in the Chicago or surrounding area would not want to run or walk it. So who is the lucky runner that will be running the 13.1 Chicago thanks to US Road Sports? We had 20 total entries. 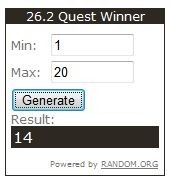 I entered 20 into random.org and 14 was the number generated. Comment #14 was Love Lyubov Boyuk who interestingly enough is on a quest to run a half marathon in every state starting with the recent 13.1 New York, where she ran a great first half marathon. Love Lyubov Boyuk, please contact me as soon as possible at info@262quest.com to claim your code to enter the race. If I don’t hear back from you by Sunday morning I will have to choose another winner given the short time to register for this race. If for some reason you decide you cannot make the trip please let me know ASAP so I can find someone else that can run the race. ***** A change took place. Due to some miss-understandings Love Lyubov Boyuk was not able to accept the race entry. She was already registered for this race and thought she was going to be able to use the code to enter a different race. That being the case I worked with everyone that entered via email to pick a new winner. After two more iterations The Running Green Girl was crowned the winner, or runner, however you want to look at it. Congratulations Green Girl! Go, run hard, and enjoy the race!! Thank you to all my new readers for stopping by, if this brought you around for the first time don’t forget to “Like” the 26.2 Quest Fanpage and share it with all your friends. If you are on Twitter, I would love to count you as on of my loyal followers at @262quest, and if you don’t do social media I still have room for you using Google Friend Connect or the ever trusty RSS Feed. Whatever your preferred method, I would love to have you stop by on a regular basis! Thank you again for the opportunity, Tim!